Gold Leaf Brush Kits for Mirroring Reverse Glass Signs, Surface gilding Gold Leaf and Mica Powders. The combo discounts of buying the Gold Leaf Brushes together save you money. Question on how to use the brushes can be found in our How-to section of the web site plus theres videos on various techniques for free. Along with the Gold Leaf Brush Kits, we've include a few of the other commonly needed materials to Gild Gold Leaf. Individual brushes listed BELOW! 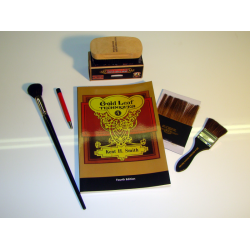 Gold Leaf Brushes Starter Kit Gold Leaf Brushes Starter Kit, are the basics for gilding brushes, used in reverse glass gilding and surface gildin..